This year, Reserve Officer Emad Wassef attended motor school, graduating in March. He told The Rotator: “As a kid I watched the CHiPs TV show. It intrigued me and inspired me to become a police officer. I applied to join LAPD but there were no full-time positions at the time, due to a hiring freeze.” He joined the reserve program, Academy Class 4-97R. He did his probation at HWD Patrol, transferring to WTD in 2006. He first applied and was accepted into motor school in 2009. Two days prior to graduation, Wassef came down with a stomach virus, which led to severe hydration and kidney failure. “I lost my chance to graduate. Afterward, the LAPD had no motor schools scheduled until recently,” he said. Officer Wassef reapplied for the February 2017 class. After the course, Officer Wassef rode “with SEC every day on Los Angeles streets and freeways … to ensure the ability to handle normal working shifts as a motor, conducting traffic stops.” After being cleared, he reported to his division, WTD, for what’s called “mother hen”: riding with a senior officer for a few days to cover the dos and don’ts. 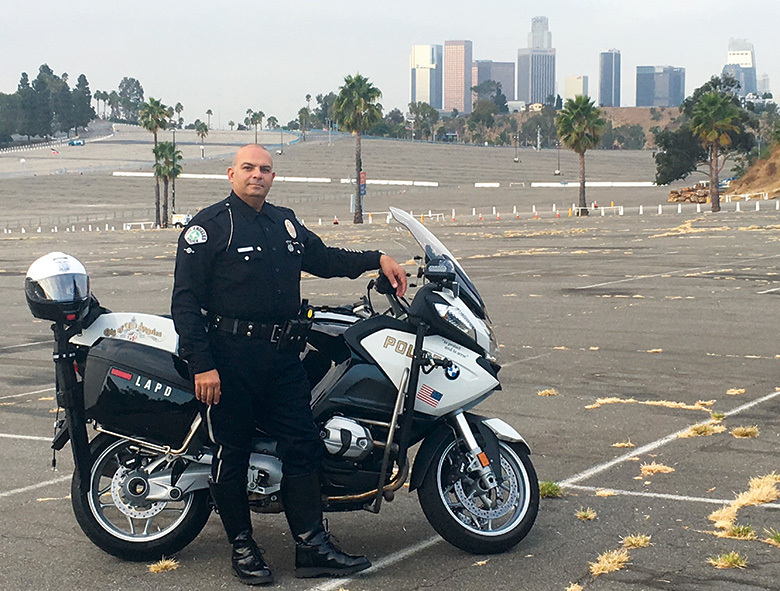 Reserve Motor Officer Wassef was assigned a BMW R 1200 R police edition after graduating to complete the training and mother hen. “Commissioner Robert Saltzman asked for information on the Reserve Motors, inquiring why only West Traffic Division had a unit. “He then asked Assistant Chief Michel Moore to provide some history on the Reserve Motors. Chief Moore said that the idea for the unit sprang up in 2004, and was evaluated: ‘We said, these officers would have to go through and understand the rigors of the Department’s motorcycle program and have to maintain proficiency in the operation of a bike. We have very high standards on that.